Okayy, after a loooong pause of not having "1 item 4 ways" posts so I think it's about time for a new post on that subject! This time there's something a little bit different though, I used to do my 1 item 4 ways using looklet.com but I've been having problems with Looklet and they still haven't replied any of my mail which is kinda sad so I've stopped using looklet ever since. So this time I'm using polyvore instead. I'm gonna used my own set to express my take on the item or how I would wear the item, while the rest of the sets is other people's take on the item. 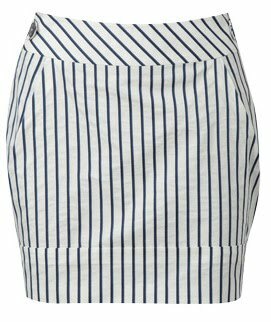 The 1 item is this nautical striped skirt from Karen Millen. The first set below is my set. With nautical stripes I'm thinking casual day out shopping and walking around the city, so I dressed this skirt with a white top (but not just a simple white top oh no it's not, it has a caged detail at the shoulder and a cute opening at the back). I thought the striped detail on the flat shoes bows would accentuate the skirt more. Don't forget the cute sky blue necklace to "color" the white top. This set below is how Bethiesue08 would dress it. I love the chic meets tough look on this one. You can pair the striped skirt with a trend item such as this ruched puffed sleeve chambray top. And to toughen it up a bit just add a tough looking leather boots and multi-layered chain necklaces. The striped skirt can also be paired with a long sweater, like brionessa2008's set here. It's laid back but still looks chic with added accessories such as the gold studded belt in a totally different color and a high-heeled wedge shoes from topshop. You can also pair stripes with stripes! Just keep it a similar striped pattern and do less, don't do a full striped look, for example: with this skirt a sleeveless striped top would look better than a long-sleeve striped top. Or you can cut the stripes by wearing a jacket or blazer. If needed, you can put on a matching belt to pull the look together. This set by Milano Cookies is one good example on how to wear striped with striped. She even makes it look like a dress! PS. Don't forget to enter my giveaways on Tigerlily's Book! I have three giveaways going on right now: a $25 Gift Certificate from PromosLogos, 100pcs of customizable postcards from UPrinting, and a free box of EvoraPlus - a teeth whitening and breath freshening mints. I love the Chic meets Tough look, except for the boots- i'd love to wear it with the velcro sandals from the Rock & Roll look. They're HOT!